For the album, see The Jimi Hendrix Experience (album). "JHX" redirects here. For the business, see James Hardie. Jimi Hendrix arrived in England on September 24, 1966, and with his new manager and former Animals bassist, Chas Chandler, formed a backing band with bassist Noel Redding and drummer Mitch Mitchell. Mitchell was a seasoned London drummer formerly with Georgie Fame and the Blue Flames. Hendrix chose Redding because of his attitude towards music and his hairstyle. Redding had been a guitar player until that time, but played bass in the band. The name "The Jimi Hendrix Experience" was coined by their business manager Michael Jeffery. The first official appearance of "The Jimi Hendrix Experience" (invited by French singer Johnny Hallyday) was at the Novelty in Évreux, France, on October 13, 1966. Six days later the band played their first UK gig at a private showcase at the Scotch of St James. Though conceived as back-up band for Hendrix, the Experience, as a unit, gained fame and critical acclaim. 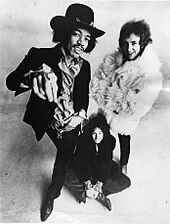 Following the lead of Cream, the Jimi Hendrix Experience was one of the first groups to popularize the "power trio" format, which limited a rock band's line-up to guitar, bass and drums. Hendrix combined lead and rhythm guitar styles, using fuzz and wah-wah pedals to modify his tone. Mitchell sometimes utilized jazz-influenced grooves, while Redding played simple bass lines that helped to anchor the band's sound. Hendrix and Mitchell experimented with a larger ensemble that included bassist Billy Cox. Sometimes referred to as Gypsy Sun and Rainbows, they performed at the Woodstock Festival in August 1969. By November the lineup split and Hendrix returned to the trio format with Cox and drummer Buddy Miles. After recording the Band of Gypsys album and an aborted performance in January 1970, Miles was fired. Michael Jeffery (now Hendrix's only manager) called Redding and Mitchell about reforming the Experience. Both agreed to participate in a tour. Hendrix was open to having Mitchell rejoin, but reluctant to bring Redding back into the fold. ^ "Noel Redding, 57; Bass Guitarist in Jimi Hendrix Band". Los Angeles Times. May 14, 2003. Retrieved April 19, 2015. ^ Potash, Chris, ed. (1996). The Jimi Hendrix Companion: Three Decades of Commentary. Schirmer Books. p. 66. ISBN 978-0-02864-609-1. 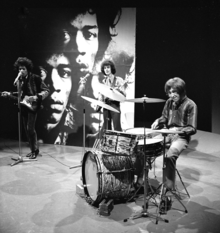 With drummer Mitch Mitchell and bassist Noel Redding [Jimi Hendrix] formed the Jimi Hendrix Experience. They were the first of the super high energy bands — the epitome of acid rock. ^ Christopher Knowles (October 1, 2010). The Secret History of Rock 'n' Roll. Simon and Schuster. p. 147. ISBN 978-1-57344-564-1. ^ a b c During the April–September 1970 tour with bassist Billy Cox, the trio was sometimes referred to as the "Jimi Hendrix Experience"
^ Whiteley, Sheila. "Progressive Rock and Psychedelic Coding in the Work of Jimi Hendrix". Popular Music. 9 (1): 37–60. doi:10.1017/s026114300000372x. ^ a b "The Jimi Hendrix Experience". Rock and Roll Hall of Fame. 2008. Retrieved March 19, 2009. ^ a b c Unterberger, Richie; Westergaard, Sean. "Jimi Hendrix > Biography". AllMusic. Retrieved March 19, 2009. ^ "Jimi Hendrix sites". www.musictrekker.com. Retrieved December 5, 2015. ^ Snow, Matt (November 2006), "3 is the Magic Number", Mojo Magazine, pp. 81–82. ^ a b Gilliland, John (1969). "Show 53 – String Man" (audio). Pop Chronicles. University of North Texas Libraries. ^ Mitchell, Mitch; Platt, John (1990). Jimi Hendrix: Inside the Experience. New York City: St. Martin's Press. pp. 88–96, 48–149. ISBN 978-0-312-10098-8.